Cyclamen repandum is a spring flowering species from southern Europe and the Mediterranean. If you have a shaded area in the garden and would like to add a little colour in spring, then this is a plant that can be planted in drifts to great effect. Attractive red to pink flowers with a darker red nose appear in good numbers and last for weeks. The flowers are mildly fragrant with a sweet scent and then the foliage is attractive for months to come. This a variable cyclamen species and flower colour can vary always in shades of pink. 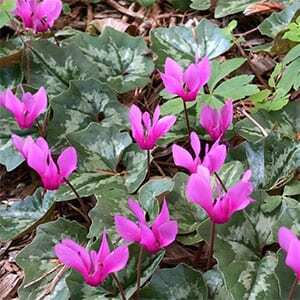 An interesting species in that it tends to hide its tubers deeper in the soil than most other cyclamen. The harsher the conditions the deeper the tubers will pull themselves down. In the garden it will self seed eventually forming large drifts, ants tend to spread the seed and plants can appear in rather random positions after a few years. Being a woodland plant Cyclamen repandum grows best in filtered light and in a humus rich well drained soil. Once established it is remarkably hardy. Dig the soil over well before planting, adding good amounts of compost and aged cow manure. Plant the bulbs at around 5 cm (2 inches deep). Water in well with a liquid seaweed fertiliser. An annual application of mulch and cow manure when the plant is in dormancy should be adequate. In cool climates you can grow this attractive little plant in containers and in warmer climates it will grow well in a woodland position in the garden. Best protected from frosts and a moist soil through spring is important. Wet soggy soils are not suitable. Propagation is from seed which is collected and sown as fresh as possible.